Stunning concept artwork is the star of this behind-the-scenes look at how Disney reinvented a cinematic classic. A revealing and absorbing book that really ought to give more credit where it's due. Disney's innovative reimagining of The Jungle Book has been the cinematic hit of the year. But while critics have been united in their praise for the 2016 reboot, which draws on both Rudyard Kipling's novel and the 1960s cartoon, they've been a little unsure about how to describe it. It's not quite "CG animation" and not quite "live action", instead using motion capture to create a hybrid of the two. It's digital animation that's also handcrafted. It's live action photorealism that's often entirely pixellated. And it's precisely this boundary-pushing approach to filmmaking that makes this behind-the-scenes artbook such a fascinating read. Following a foreword by the director, Jon Favreau (Iron Man, Cowboys & Aliens), author Ellen Wolff, a writer specialising in animation and VFX, takes you through the making of the movie in six well-structured chapters. We learn how Favreau delved into Disney's archive for inspiration; how the creature artists melded anatomical accuracy with the mocap actors' own facial features; and how virtual environments were used to enhance the emotions in the story. As the director puts it: "We feel like we're out in fresh snow, with no tracks to follow. We're using technology that no one's used before, doing something in a way nobody's ever done." The final two chapters explores how the animators and VFX artists brought the concept art to 3D life, facing such challenges as making fur and muscles move in the rain, and how to give talking animals mouth movements that seem believable. We also follow the process of building digital environments and combining them with photographed images, in a process that Ellen describes as "like solving a Rubik's cube." 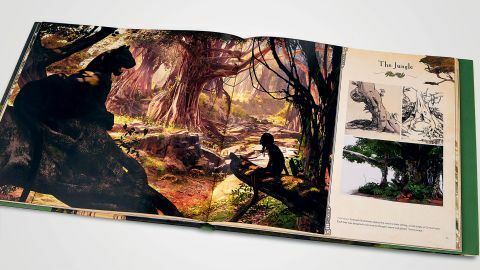 Throughout 160 glossy pages, all this textual detail is complemented with stunning artwork, including pencil sketches, concept art, storyboards and film stills, as well as behind-the-scenes photography on set. The carefully considered layouts give the book a cinematic feel that encourages you to pore over every detail of every image. Near the end, there are five double-page walkthroughs, showing how two characters – Shere Khan and Raksha – and three environments were built. We're not sure whether the 10 pages of interviews with the voice cast adds much insight to the book's 'art' subject, but that's a minor niggle. Unfortunately, there's a much bigger one: nowhere do you hear from the artists themselves. In fact, not one of the conceptual or storyboard artists whose work is used throughout is credited anywhere in the book. It's for this glaring reason we're unable to give this otherwise impressive book full marks. This article originally appeared in ImagineFX issue 138; buy it here!